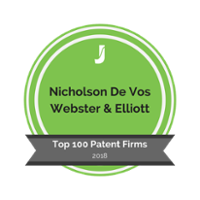 Nicholson De Vos Webster & Elliott LLP is a boutique intellectual property law firm offering high-quality patent law services to Silicon Valley innovators. The materials found on this website (the Website) are provided by Nicholson De Vos Webster & Elliott LLP (the Firm). The use of the Website by you is subject to the following Terms and Conditions: The materials found at this web site are for general information purposes only, and are not intended as legal advice. Neither transmission nor receipt of information from this site creates or constitutes an attorney‑client relationship. The Firm does not guarantee the reliability, accuracy, or timeliness of any information or materials contained at any third‑party link on the Website. The Website was created by the Firm and is copyrighted 2016 by the Firm. All rights are reserved. You are hereby granted permission to view, store, and print material contained on the Website, provided that none of the material is modified or altered. You are not permitted to reproduce any material from this site for commercial purposes without the Firm’s express written consent.